Seth Thomas Calender Clock. 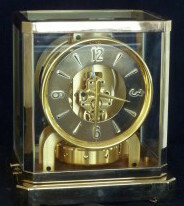 This clock is from the late 19th or early 20th Century. It is a single weight driven eight day clock that tells the time of day, the day of the week, the day of the month, the month and it allows for LEAP YEAR; all this done mechanically with cogs wheels and levers driven by gravity. The clock is quite large and heavy; it stand four feet tall and is eighteen inches wide and hangs on the wall. 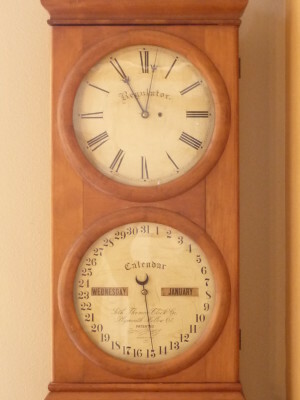 It does have a pendulum which cannot be seen as it swings behind the two dials.